One of the many long standing traditions of the Barleylands annual Essex Country Show is supporting worthy charities, and each year donations are made to local charities selected by show committee members. 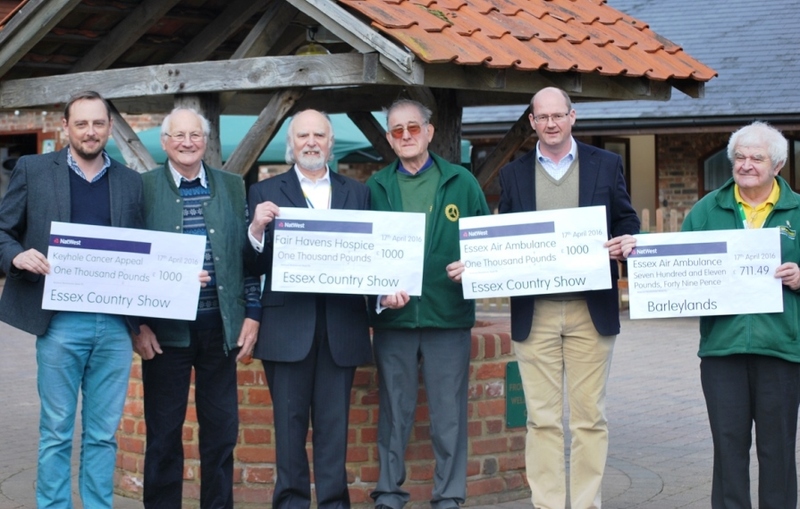 On Sunday 17th April 2016 Essex Country Show Committee Members made their latest cheque presentations to the representatives of their nominated charities where each charity was officially presented with a cheque of £1000 following the 2015 show. The charities nominated for 2015 were; Fair Havens Hospice, Essex Air Ambulance, and Southend Hospital (Keyhole Cancer Appeal) with other charities also benefitting from the show including the local Scouts, Girl Guides and Essex Young Farmers who all take part in the show weekend, and Breast Cancer Now who received a donation. Highlight of the Barleylands calendar, the 2016 Essex Country Show will be held on Saturday 10th and Sunday 11th September and, as well as breathtaking arena shows, will showcase agricultural history and be packed with fun for all ages. The committee nominations for the 2016 charities will be announced in early summer. Barleylands also took the opportunity to present Essex Air Ambulance with a cheque for an additional £711.49 made up of visitor donations into the Wishing Well in the Craft Village over the last year.